Pink is in. Not that it was ever out, really, but the folks over at L'Oréal were especially in tune with the softly structured femininity evident on the Valentino runway when they created the "Les Pinks" collection for Fall. These are 8 new shades of the Colour Riche Lipstick and 3 new shades of Le Gloss, ranging from the palest pink to the hottest fuchsia. I had the chance to try two of these: Ballerina Shoes and Everbloom. The Colour Riche Lipsticks are a drugstore classic, and for good reason. 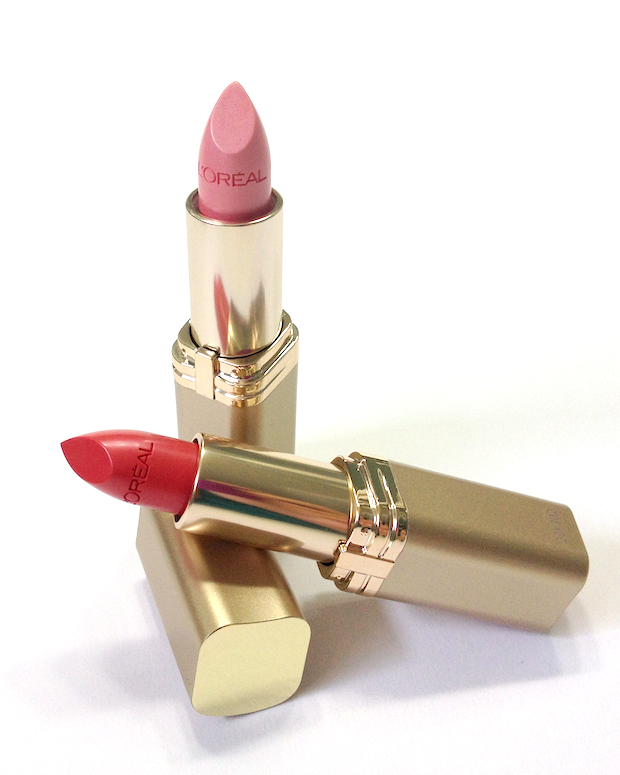 The brushed gold packaging, the great range of shades, the creamy texture and good pigmentation are like the lipstick equivalent of That Dress. The one that always looks good on you, no matter how many times you've worn it, that always looks well-put-together and elegant, even though it only cost a fraction of the price tag it conveys. The only thing I can ever find to complain about is the scent - it's a little old-school, and could stand a revamp. 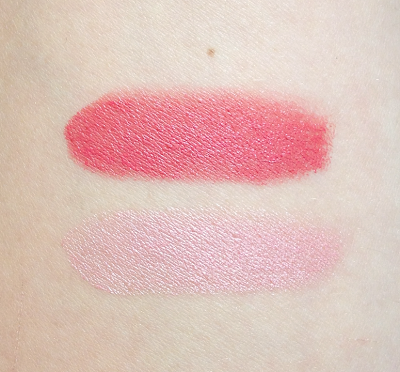 Everbloom is a rich, warm pink that sits somewhere between watermelon and coral. It's a bit of an odd colour to plunk down in a Fall collection, but it's so pretty I can't complain. In the tube, Ballerina Shoes looks like it might be something from a 60s beach party. It's not a universal shade, but it is far more wearable and flattering than a first swatch might indicate. It is a baby pink frost, but unlike many such shades, it doesn't leave the lips looking dried out and flaky. A finish like this can sometimes look like it's just sitting on top of the lip if it's applied straight from the tube, so I pat it on with my finger and find the result looks sweet and super chic. It can also be dabbed overtop a deeper pink to add some dimension. Availability: These are a permanent addition to the line, currently out in most drugstores. Price is 10.99$ CAD, and 7.99$ USD. Pros: Elegant packaging, creamy texture, good pigmentation. Everbloom feels hydrating. Everbloom is a great late summer colour and an unexpected one for fall. Ballerina Shoes is a nice modern interpretation of a paler pink lip. Both are very on-trend. Cons: The scent is quite strong and particular - I don't like it, though YMMV on this one. It does dissipate after a while. I just bought a L'Oreal lipstick and can't fathom why they can't try to mask the smell better. I do like their lipsticks in general though. I think their lipstick range is really great, and it's just frustrating that the scent distracts from the quality. It's just so dated, when the formula really isn't.